Devoted to Social and Political Progress. Boston, MA, and New York, NY. Publisher: Redding and Co. (Boston); Burgess, Stringer and Co. (New York); Crosby and Nichols. Editor: George Ripley. 1/1, June 14, 1845-8/15, February 10, 1849. 12 pp., $2.00 a year. Ripley (1802-1880) was a former Unitarian minister and a leading Transcendentalist and Fourierist, and he was one of the founders of Brook Farm, a community that Ripley believed to be the new Jerusalem, "a city of God, anew." The farm was one of a series of nineteenth-century experiments by those who believed that human nature and basic economics could be overcome by high thoughts, hard work, and enthusiasm. It could not be, and the venture was never a financial success and almost immediately fell into internecine squabbles as the group began to re-discover the value of incentives and the resentment engendered by distribution of goods without concern for the value of the work contributed. Despite this, the farm's members and the example of its attempt inspired many early spiritualists. Ripley himself was an early advocate of Andrew Jackson Davis's revelations and attended at least one of the Fox Sisters' seances. 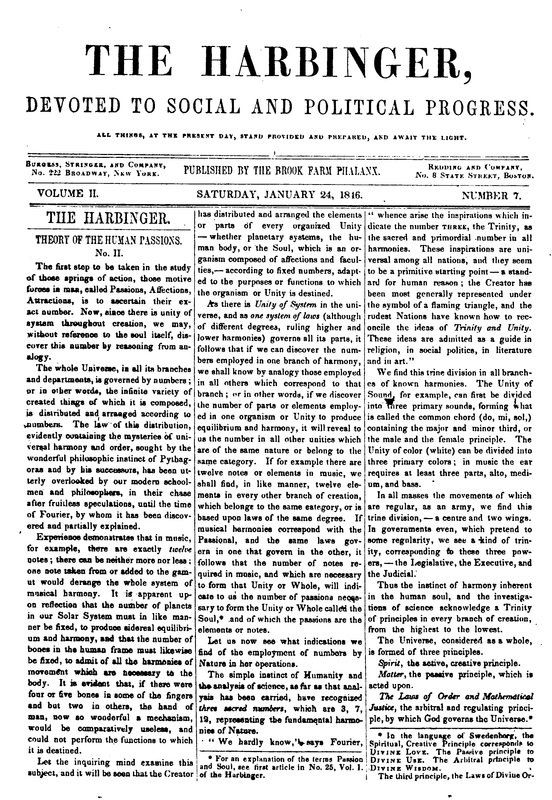 The journal was the successor of the Phalanx, published in New York, after the Fourierists moved to Brook farm, but it continued to be the exponent of Fourierism rather than the organ for the farm. It was issued by the Brook Farm Phalanx for four volumes and then by the American Union of Associationists, both advocates of Charles Fourier's variety of utopian socialism. Occasional contributions by James Russel Lowell, John Greenleaf Whittier, and Horace Greeley, and regular discussion of the perceived social problems of the day. The journal was combined with the Univercoelum and Spiritual Philosopher to form the Spirit of the Age. NYPL.